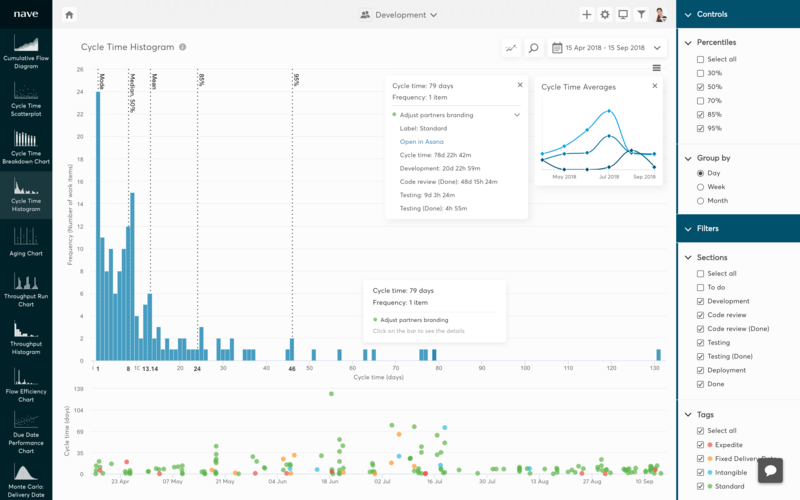 Cycle time histogram for Asana by Nave shows the overall distribution of the completion times of the tasks in your process. A typical cycle time histogram usually has a big hump on the left and a long tail to the right. If the spread of your data is too wide, it means that you have too variability in your process. Pro tip: Establish pull policies for each state of your process so the time your task spends in each state becomes consistent and predictable. Cycle time histogram by Nave uses past cycle time data to estimate likely delivery dates. Percentile lines show the probability of tasks being completed within a certain cycle time. It's easy to calculate - higher percentile lines indicate a higher likelihood of delivering within that time frame. Pro tip: Use percentile lines to define service level agreements. Discuss the different levels of confidence with clients and stakeholders and base SLAs off their optimum comfort level. We recommend using the 85th percentile line to start with. This chart overlay shows the mean, median and mode average cycle times and how the trends build over time. Measuring your average cycle time lets you evaluate your team performance. Ideally, the lines should be close to each other, stay even or go down. The faster your cycle time, the better your performance. Pro tip: Choose your average and watch its line profile! If the line goes up, this means that your team needs more time to complete their tasks on average. Make sure you have work in progress limits in place to prevent bottlenecks and let the work flow smoothly. Increase your team performance with Nave!